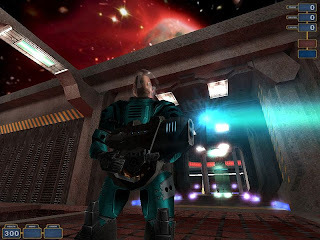 Alien Arena 2007 is a free and open-source first-person shooter game that's based on source code released by id Software. 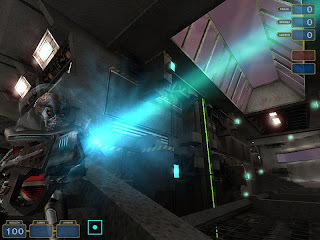 Started by COR Entertainment in 2004, the game combines a 1950s-era science fiction (sci-fi) atmosphere with gameplay similar to the Quake, Doom, and Unreal Tournament series. Alien Arena is primarily an online multi-player action game, although single player campaigns are also available against bots. 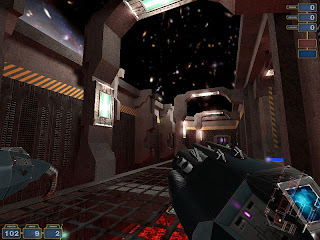 Alien Arena’s game environment as well as the characters was rendered very well. 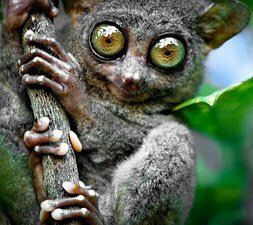 I think the graphics such as the backgrounds and the visual effects can be easily compared to any popular Windows first-person shooter games available right now. I adjusted the default screen resolution to suit my 19 inch widescreen monitor without trouble. I also had an option to fine-tune texture and lightmap brightness, turn on bumpmapping and several other key preferences. In addition, you can also turn off blood to reduce the violence a bit. The sound is on the average side and I find it very basic. Maybe I needed a good audio system to better appreciate or judge the sound quality. There are 35 standard maps to choose from, 11 player characters, and 9 weapons with alternate fires, and a grappling hook. 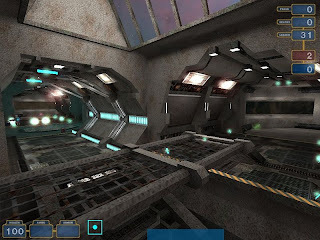 The game is powered by the id Tech 2 based CRX Engine, which features 32 bit hi-res texture support, shaders, textured particles, stainmaps, reflective water with refractive shaders, light bloom, real-time shadows, real-time vertex lighting, normal-mapping, and other modern effects, all of which can be turned on or off in the menu. Also featured is an internal server browser for finding other people to play online and the external Code Red Galaxy program which also serves as an IRC interface. Alien Arena features standard Deathmatch, similar in style to Quake III Arena and Unreal Tournament. Also included are Capture the Flag, Deathball, Team Core Assault, Team Deathmatch, All Out Assault, and Cattle Prod, a new play variant that requires players to herd robotic cattle to earn points. There are six game mutators (excessive, instagib, rocket arena, vampire, regeneration, and low gravity) which can alter the game to play differently. All modes can be played online against other players or offline against bots. The bots can be customized using an external program included with the installation of the game. Alien Arena features 9 weapons and a grappling hook, each with a secondary function. You start out with the Blaster and the Violator, and can pick up other weapons at their spawn points in the various levels (assuming a weapon-modifying mutator isn't set on). The weapons progress from 1 to 9 roughly in order of power. I find the game very addictive, although I’m a "below average" gamer. I always get smoked in single player game even in easy mode. Maybe they gave those bots too much AI (hehe). Anyway, I also tried multiplaying over the network and I got eaten alive. I’ve heard that there’s even an Alien Arena community that organized a weekly event called Martian Mayhem Tourney where large sum of players gather into one password protected server to frag until the time limit is reached. Passwords are given out in IRC Channel #alienarena@EFNet, or #alienarena@QuakeNet. I think I'm going to have to practice more before I’ll decide to join. You can visit Alien Arena project website by clicking HERE. Nice Review of Alien Arena 2007! I am not just saying that cause you mentioned me in the article. I am glad you gave the game a try let alone doing a full blown write up of it. Here are some other free cross platform games (Linux-Windows-some mac): Of course you can play them all online for free. Great Review dude. I'm downloading that game right now to check it out. Try also WOP World of Padman. Amazing stuff. Thank you for the review. It will inspire game developers to make more quality games for Linux. Keep it up! Thank you for your kind comments. I will be checking other Linux games too and hopefully write a review also. I'll try to do it at least once a week or as much as I can. Hey new version out, huge improvements across the board! I played this game, It's really good, today it's hard to find a game with this great graphics and audio and also free. all the reviews for this game shows that it's great.